Upon visiting a city, what’s the first thing you do? Go the most popular tourist spots? Or see the sights less seen? We’re insatiably curious about the streets and buildings that comprise cities. Our slow travel mode of operation means engaging with how people live in a city – both past and present. In February 2017 we spent a week house sitting in alternative Berlin spending much of our time wandering around and eating all the delicious food. Berlin was so good to us that we came back again for another house sit that following August! It’s a great city for the alternative traveler. Taking walking tours is a great way to learn about the unique history of each place we visit, because what is a place without its historical, cultural, and contemporary context? During our visit, we sought out the best alternative things to do in Berlin, learning about the many subcultures, squats, and street art. So take a stroll with us through the intriguing streets of unusual Berlin and its lesser-known history. Squatting has happened all over the world for hundreds of years, but Berlin has a particularly rich history that continues in full force to this day. Berlin’s current squats aren’t tucked away and coexist proudly next door to apartment buildings throughout the city. The Rauchhaus, allegedly the oldest continually occupied squat in Europe, has been in place the 1970s. The historic building used to be a hospital that the occupying American forces tried to demolish to create a highway. Berliners took to the streets and protested the hell out of the situation until the city bought the land and gifted it to the city. Today it is a cultural center with the squat occupying the building and yard next door. Many squats offer homemade meals for cheap to any and everyone – definitely one of the most non-touristy things in Berlin you can do. Our favorite squatter story comes from a Turkish man named Osman Kalin who set up shop just down the road from the Rauchhaus when there were still two Berlins. The vacant lot was technically under the jurisdiction of the East German authorities, yet fell on the Western side of the wall because of cost-saving measures to build the wall in a straight line. Osman saw an opportunity and started to grow a small garden on the land, eventually also building a makeshift treehouse entirely from found materials. The nearby church allowed him to use their water without charge to grow his garden. He quickly became a beloved figure in the neighborhood and indeed all of Berlin. After the fall of the wall, authorities wanted to demolish Osman’s treehouse to build a road, yet locals and the nearby church rallied behind him. Osman, now in his nineties, and his family live in a nearby apartment building. Apparently, he often sits outside in the treehouse garden, happily waving and smiling at passing admirers. Berlin is often called the “Street Art Mecca” of the world. Artists come from around the world to paint the town with their creativity, and you can see pieces from world-famous artists from the U.S., Brazil, the U.K., Poland, Spain, Denmark, and of course Germany, as well as many other countries. Berlin as a city is all about expressing yourself, being unique, and showcasing your artwork – whatever form that may take. We were surprised and impressed to learn about many alternative kinds of street art, like interactive and movable pieces, metal sculptures, paste-ups, and other tactile forms of art. Dircksenstrasse is a road in Mitte that is absolutely covered in a variety of street art. Here we’ll share just a few of our favorite pieces, but make sure to visit this street yourself and have a look! Little Lucy is a reference to a propaganda Czech cartoon from the 80s. In each Lucy piece, she is killing the cat she owned in the cartoon in a different manner. The Little Lucy series was created by Spanish-born and now Berlin-based artist El Bocho. Read more about him and his work here. SOBR is the French photographer behind the It’s Time to Dance Project, which features paste-ups of girls he has photographed and (after asking permission) made into fun street art. He wanted to show women in their own element, having fun and not posed specifically for a photo. These pieces can be found not only in Berlin but also in Paris, London, and Marseille. The metal piece below is by Danish artist Tejn and is part of his series on escapism. The figure is chained to the wall and apparently there used to be a hatchet just out of the sculpture’s reach – until someone stole it. Our guide told us that it was unusual that the entire piece still existed because usually, large metal pieces are stolen to be sold as scrap metal. Apparently, Tejn doesn’t get mad about this vandalism of his work, he sees it as part of the process and interaction of people with his artwork. Very Zen, Tejn. This tucked away alley is easy to miss if you don’t know to look for it. One of the last remnants of what East Berlin used to look like before the wall fell. Shortly after, artists moved into the abundance of abandoned apartments and East Berlin quickly became an artists’ haven. The Dead Chicken group was one of these artist collectives and their space has been preserved to this day. One side of the alley is reserved for professional artists who can come and paint murals while the other side is a free side, meaning it is open to anyone (including visitors!) to leave their mark. There’s a lot going on today in the alley, with a small museum dedicated to a man who created a workshop to employ blind Jewish people during WWII, a very smokey bar, and an underground show of robotic monsters and probably one of the most unique things to do in Berlin. 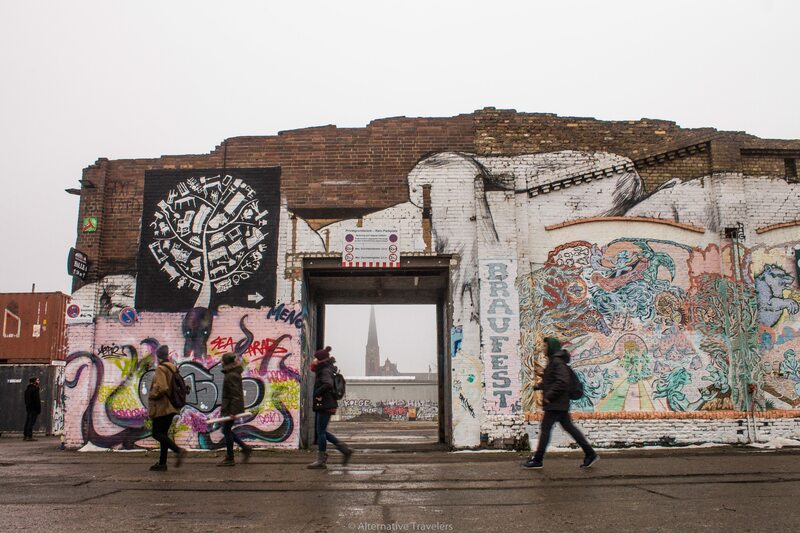 An old railway complex turned subculture compound, this spot was one of our favorites in quirky Berlin. And this is even considering the fact that it’s mostly outdoors and we froze our asses off exploring it. RAW Gelande is a great example of Berlin’s culture of reuse and repurpose. The complex is home to a climbing gym (with an outdoor climbing wall on the outside of an old bunker! ), an indoor skate park, famous clubs, bars, food trucks, and of course, lots of street art. We even got to meet the Momo Master himself (read the full story in our Berlin Vegan Guide). Berlin Graphic Days, a graphic design pop up market that happens once a year, luckily was taking place right as we arrived. Artists from all over Europe come to showcase their wares – all of it was incredible. Though we don’t want to accumulate stuff in our temporary home, most artists had little postcards for sale for a euro or two. We always try to support local artists and were happy to buy a bunch to adorn our apartment’s walls back in Madrid. This one is hardly an underground or unknown spot as the East Side Gallery is the most famous example of street art in Berlin. The East Side Gallery is a 1.3 km long preserved section of the Berlin Wall painted with poignant murals of street artists from around the world. Possibly the most massive example of site reuse in Berlin is the 300-hectare Tempelhofer Feld. The former airfield is steeped with history and is named after the Knights Templar that inhabited the land in the medieval era. In addition, Tempelhof was the site of the Berlin Airlift of 1948, when the Western powers supplied Berliners with food and other essentials. For more history of the site, The Guardian has a great recent article. Today the airfield is a public park that often has concerts and other events. Don’t miss Tempelhofer Feld – it’s an incredible space. You cannot go inside Tempelhof Airport itself without a tour. Click to learn more about the tours below. Tempelhofer Feld in Winter. Note the women with baby strollers, just out for a casual, frigid stroll. The community garden, dormant for the winter. Berlin’s dramatic recent history and the many hands that took part in its reconstruction. The near leveling of the city during WWII and reuse of existing buildings leave the city with a bit of a hodge-podge feel – in an interesting way. The city’s multiculturalism can be felt in the large Turkish neighborhood aka Little Istanbul, in the many languages spoken everywhere, and the abundance of eateries from what feels like every country dotting the streets. For more cool stuff in Berlin, check out our Vegan Guide to Berlin or travel story A Trumpster in a Nazi Museum. We thoroughly enjoyed quirky Berlin and can’t wait to explore it more in the future! Are you a fan of street art – are there any pieces in your city? Would you like to visit Berlin someday? Or maybe there are some non-touristy things to do in Berlin that we missed? Let us know in the comments! *Editor’s note: This post was originally posted in March 2017 and has since been updated.